This is a subscription based app containing a large amount of content with a variety of different ways to help young people learn to read. 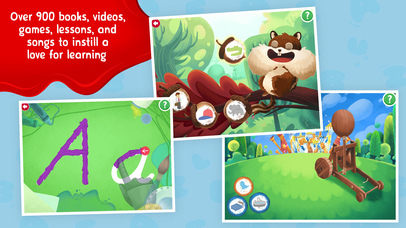 The app works through the whole process of learning to read, in great detail, through phonics using storytelling, interactive graphics, instructional videos and live action teaching. There is a lot of fun within the app, which will certainly keep users returning. There is an ongoing cost of $9.99 monthly after receiving the first 2 weeks for free. This subscription app aims to help young people through the process of learning how to read by using a whole host of different approaches to keep young people engaged and wanting to learn. 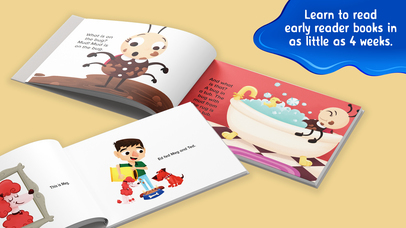 It is clear from the developer’s website that they are passionate about helping young children in their journey to become competent and confident readers but also that they are quite knowledgeable about the subject too. On the website there is a specific section dedicated to pointing out that reading should be a fun experience ratherthan one that is a chore that children are made to do. 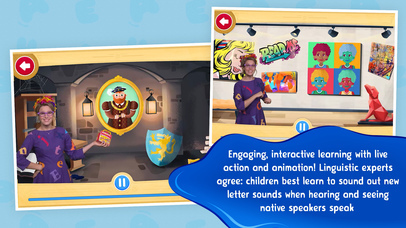 It points out how the app focuses on these features of reading by using immersive environments, engaging characters as well as entertaining stories and it really shows how committed they are as a developer to instill a love of reading in young children from the outset. There is also a good section on the website explaining how to use the app and how to get the most out of it. This is really useful for a someone looking to download the app and set up a subscription as ongoing users will most likely be researching to make sure their money is well spent. I would suggest that this app would probably be best used with a young person and an adult working together due to the nature of the app, however, as users become more competent they will be able to access the content themselves. The actual content of the app is made up of lots of different interactive elements as the user moves through the story. The story itself is based around a young person going to a museum and discovering that there is a lot to learn in the museum itself especially when a knight decides to show him the alphabet game to help him learn his alphabet. The user then learns along with the main character and moves through the museum together interacting with the artwork. In each piece of art the user is introduced to a letter and then given the opportunity to hear it, say it, read it and then learn it. The way the app does this is fully immersive with so many games and videos, which includes a main character, or real life teacher, guiding the user through. Not only is there an immense amount of content within the app, over 900 games, videos, early learning books, memory songs and exercises, there are also some really good added bonuses within the app. The user can at any time stop following the story and enter a ‘room’ within the app where they can practice the games and activities they have already completed within the app. Using this repetition allows the user to compound their learning and this is one of the best methods that can be employed when it comes to learning how to read. All the activities are game based too and this follows the developer’s desire to make reading and learning to read a fun, interactive experience. In setting up a user on the system there is also a login process where an account is set up with the adult and this is regularly contacted by the app with congratulations for meeting certain milestones and encouragement to carry on with the app to make the next steps. This is a good edition especially as this is the type of app where a parent can be fully engaged with their child in learning; which should be an expectation too. Overall this is an excellent app that has so many fantastic features within it. Although there is a subscription cost I think this is fully justified with the amount of content available and the quality of the content. 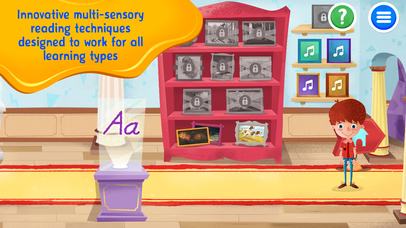 The Phonics Museum is where children read, in record speed. Children will learn to write long before they’re able to hold a pencil. and write by writing with their fingertip--an incredible advantage. 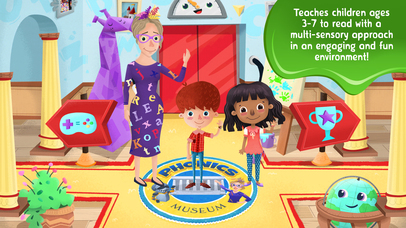 Right now your child can try Phonics Museum FREE for 2 weeks. If you enjoy your trial, you don’t have to do anything at all and your membership will automatically continue if you choose to remain a member. Membership is $9.99/month, charged to your iTunes account automatically after the free trial period is over. You can cancel anytime. - You may turn off auto-renewal in your iTunes user settings at any time during your 2-week free trial and you will not be charged. - Payment will automatically be charged to your iTunes account after the period of your 2-week free trial. - Your iTunes account will be charged for renewal within 24 hours prior to the end of the current period. Monthly Membership - unlimited access on any device for $9.99 per month. Add up to 3 children per account. Cancel anytime. Annual Membership - unlimited access on any device for $99 per year. Add up to 3 children per account. Cancel anytime.